While metals such as steel can stand up to harsh abrasives, many softer ones, including those that contain lead, cannot. Pewter is a soft metal that may or may not contain lead. Flexible soft metals are used to make home decorations such as vases, portrait frames, and jewelry from simple to intricate forms. Cleaning and polishing soft lead metals regularly will help keep these items looking more than they are worth, day in and day out. Taking special care of soft metal helps maintain its timeless appeal. Put on protective gloves and then open a window to let some clean air flow in. Mix 4 tbs. each of whiting and denatured alcohol in an old mixing container. Adjust the amount of mixture as needed to form a paste and then go to Step 4. Follow this step to shine brightly finished leaded pewter; otherwise, to polish soft lead metals with a dull finish, go to Step 3. Mix four tbs. each of powdered pumice with the mineral oil in an old mixing container. Adjust the amount of mixture as needed to form a paste. Apply the paste to the metal in one direction, using a soft, dry cloth. Dip a clean, soft cloth in a bucket of hot, soapy water. 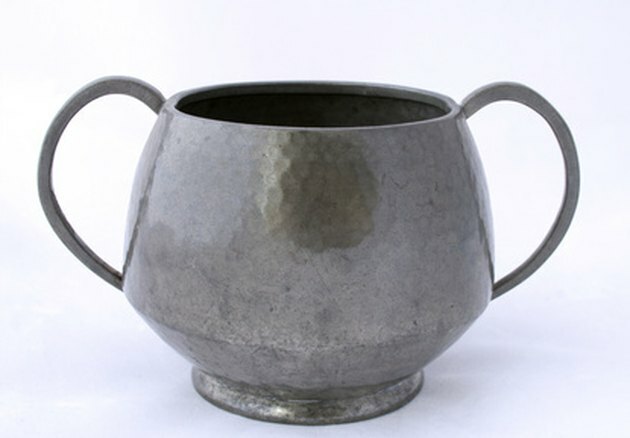 Wring out the excess water and wipe clean the pewter metal or other soft metal containing lead. Replace the soapy water in the bucket with warm, clean water and then dip a clean, soft cloth in it. Wring out the cloth to remove any excess water and then wipe the metal clean to remove the soap residue. Use a clean,dry, soft cloth and rub the metal in one direction to polish it. Use a gentle touch and avoid overcleaning or rubbing too hard. If the metal still appears dull, continue. Visit your local hardware store and purchase a soft lead polish formulated for the metal you need to polish.